Over two hundred years after the assertions by Arango y Parreño and fifty eight years ago by Barroso Pinar, Jorge Pérez-López’s work gives us a clear view of the demise of the Cuban sugar agroindustry over the last 30 years. The work is rich in statistics and provides a good vision and description of the industry, pre- and post-restructuring, and of the many difficulties created by the current economic system. The adage “Sin Azúcar No Hay País” by Casanova is no longer valid. The industry no longer provides very high levels of employment, earnings and growth for the country. Today, after re-structuring, there are 51 operational mills capable of producing annually 600– 700 thousands tons of sugar for domestic consumption, and enough to meet export commitments to China in the amount of 400,000 tons.6 The residual of about 500,000 tons is all the sugar available for export to the international sugar market, which brings to the country foreign exchange revenue in the order of $143.3 million dollars (at a market price of 0.13 cents per pound). On several ocassions, Cuba has entered the international maket to purchase sugar to fullfill its commitments. 1. Using the comparative advantage Cuba has in its soils, rehabilitate the best soils; adapt modern agricultural cultivation practices to protect the soil and the environment . 2. Use sugarcane varieties that produce sugarcane of high sucrose concentation and low concentration of other impurities. 3. Evaluate the sugar complex to create efficient extraction plants (ingenios) with an adequate maintenance program to avoid stoppages. 4. Make the necessary logistical improvements in the railroads and road transportation infrastructure serving the mills. 5. Avoid delays in the delivery of the raw material at all cost, which is conducive to losses in sucrose quality and stoppages of the mills. 6. Bring high quality investments to transform the industry into a sugar-based chemical industry. Build the chemical plants adjacent to the mills. 7. Produce derivatives such as denatured alcohol, dextrana, ethanol, furfural, paper, bagasse boards; co-generate electricity from sugarcane biomass. 8. Evaluate the international markets for the comercialization of sugar byproducts and other chemical derivatives. An industry considered as a world leader that could be a model for a future re-structured Cuban sugar industry is the one located in Queensland and South Wales, Australia, an agro-industrial complex characterized by efficiency from the field to the mill. In 2014, 24 Australian mills produced 4.5 millions tons of sugar, of which 3.57 millons tons were exported to the world.8 In the same year, Cuba, with 51 mills, produced 1.7 millions tons of sugar and imported sugar to fulfill its internatinational commitments. The contrast of the two countries’ industries illustrates the differences in performance between a well managed plan for fields and mills versus the state of poor cultivation practices, poor infrastructure and obsolecense and disrepair of the mills. In conclusion, the re-structuring process will require the transformation of the industry into a profitable operation that creates marketable industrial subproducts. 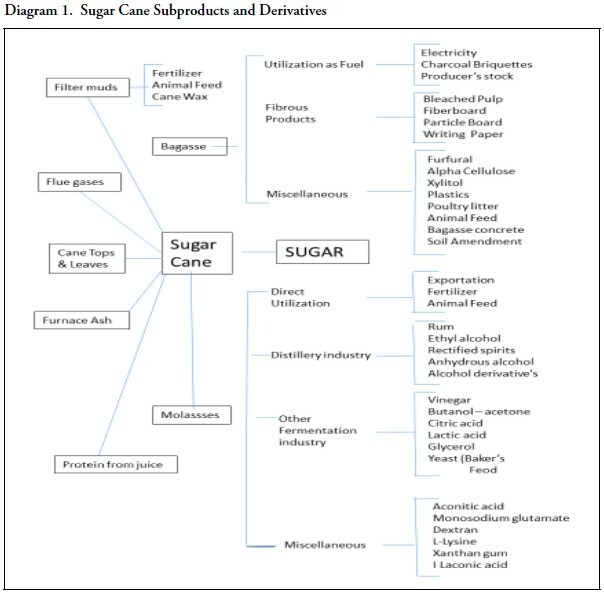 A list of sugar cane subproducts and derivaties is shown in Figure 1.10 Molasses and bagasse are the two most important subproducts from sugarcane and those can provide valuable derivatives of commercial value. Below is a brief description of the products that molasses and bagasse can provide. • Molasses, the boiled juice extracted from sugarcane through grinding, once fermented can be transformed through distillation into rum, ethly alcohol, acetic acid, butanol-acetone, ethanol, citric acid, yeast and monosodium glutamate. • Bagasse, a residue product of the cane stalks grinding process, can be used to generate steam and power to run the mill and also generate electricity for the factory’s operation. The excess— depending on the generation plant size—can be sold to the local grid. In addition, particle board, pulp and paper, furfural, furfuryl alcohol and methane can be obtained from bagasse. It is important to remember that Cuba will not recover the preferential prices its exports to the United States used to receive. Soon after the confiscation of the mills by the Cuban government, the U.S. suspended Cuba’s sugar quota. In addition, Cuba is not a member of the North American Free Trade Agreement (NAFTA) between the U.S., Canada and Mexico, and therefore its exports will not receive the special treatment afforded sugar under this agreement. Consequently, the future Cuban sugar industry will have to compete for exports in notoriously volatile sugar international markets. Through exports of sugar derivatives, Cuba may be able to obtain valuable foreign exchange. Therefore, it will be important to allocate investments to the production of derivatives that could meet domestic needs and generate export revenues for the country. 1. Francisco Arango y Parreño, “Discurso sobre la agricultura de La Habana y medios de fomentarla.” Presentado ante la Corte de Carlos IV. 1792, Sociedad Económica de Amigos del País, La Habana, Cuba. 2. Jorge Barroso Pinar, “El Papel de la Industria Azucarera en la Investigación y Utilización de los Recursos Naturales de Cuba,” Carta Pública Quincenal, Director Alberto Arredondo, Secretario Juan Varela, issue titled “La Industria Azucarera de Cuba ante el I Symposium Nacional de Recursos Naturales,” No. 62, Page 2, Marzo 28, 1958, La Habana, Cuba. 3. Anuario Azucarero de Cuba, 1958. 4. Jorge F. Pérez-López, “The Restructuring of the Cuban Sugar Industry: A Progress Report,” in this volume. 8. ASMC (Australian Sugar Milling Council), “Sugar Industry Snapshot,” http://asmc.com.au/industry-overview/statistics. 9. J. Maurice Paturau, By-Products of the Cane Sugar Industry: An Introduction to their Industrial Utilization, August 1969. 10. Adapted from J. Maurice Paturau, Alternative Uses of Sugarcane and its By-Products in Agroindustries, August 1969. www.fao.org/docrep/003/s8850e/S8850E03.htm.